All Replies on Any ideas to shorten an already assembled workbench? Any ideas to shorten an already assembled workbench? Are the long stretchers glued in as well? If you could separate it into two end assemblies it’d be a whole lot easier to cut down. If not, just carefully mark and cut with a circular saw or hand saw. If it wobbles a little, stick a couple of shims under it. the end should be pretty flat. 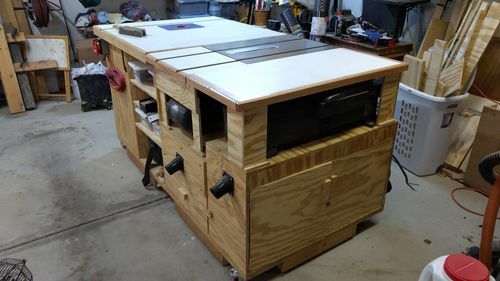 If your tablesaw is on a mobile base, it may be easier to add a piece of plywood between the mobile base and saw. This would raise the saw either 1/2” or 3/4”, and should make the current bench height work. I like Pinto’s idea. Or you can find a flat and level spot, mark the dimension (~1”?) Jack the bench legs up by 1/4” and trim them with a Jamb Saw – you can rent one for about $25. If your post means it’s to tall, then I’d roll it over, cut off the legs with a skill saw or rent a beam saw. Then add heavy duty leg levelers. Everything is glued together except for the top 1/4” layer that acts as my sacrificial work surface. My tablesaw is encased in that big cart behind the bench (the coiled cable on the left is how I plug my router in). I need to finish the drawers for that before I post it here. So, no adding height there. But Loren’s suggestion gave me an idea. I’m thinking that I would make a “fence” out of scrap that wraps around the leg. Then use that to guide my circular saw around the leg. I can screw it into the leg to keep it from moving. Then I can cut a spacer block that will position it equally from the bottom of each leg. That should make everything even, right? Personally, I’d lay the table on its side, make a small 1” guide (or if 1 1/2” is ok, just use the side of a 2×4 as a guide), clamp it at the bottom of the leg and use a handsaw. Move through all 4 legs and if they are currently level, they would remain so. Definitely saw the legs if you only need .5”. Don’t go through the ntrouble of messing with the top. Get a .5” block, scribe around the legs as it is standing currently, and then saw to the line when the table is on its side. Alternatively, you could get a 50” jointer and run it through until you get to the desired height. I did what pinto suggested for my setup. It did the trick. then why not raise the entire bench that your ts is encased in 1/2”? Personally, I d lay the table on its side, make a small 1” guide (or if 1 1/2” is ok, just use the side of a 2×4 as a guide), clamp it at the bottom of the leg and use a handsaw. Move through all 4 legs and if they are currently level, they would remain so. Ha! I think you greatly overestimate my ability to cut a straight line with a handsaw. This is not the situation where I’d want to practice. The bench has the table saw and jointer attached. The top is 3/4” MDF and 3/4” plywood laminated together. It probably weighs more than my car. And there’s not nearly enough room to get a jack underneath. Besides, from a comfort perspective, I’d like the workbench to be a bit shorter. It’s a tad too high. If you turned it upside down and tacked straight boards on all four sides on the outside of the legs I bet you could do it with a handsaw, even if your handsaw skills are as poor as you suggest. The saw would be guides on two sides for each cut. Cut the bottom of the feet off at 3/8” with a handsaw and by tipping up on its side, then use a plane to get the rest to the height you wish. As you go you can use a square to make sure everything is square on all 4 sides. Last option you can cut it off at 1” and put leveling feet on it so if there is any dips in the floor it can be adjusted to make it level. I am not sure why this is even a discussion. Just cut the legs down. Hand saw, circular saw – whatever your core competence and tools allow for. Myself, this looks like a rudimentary hand saw job. Mark your line, exercise patience, let the saw do the work. Use a portable belt sander to clean up your cuts if need be. I liked the idea of cutting it an extra 1/2” short and adding leg levelers, but that is just my preference speaking. That’s what I was suggesting, but you explained it much better. As a few others have said, worst case scenario, you cut it a little more than you need and put leveling feet underneath. That s what I was suggesting, but you explained it much better. That’s more or less what I was thinking, too, except I would use a circular saw instead of a handsaw. That way I have a much better chance of making the bottom flat. If I still screw it up, I bite the bullet and use GR8HUNTER’s idea and spend the $25 on levelers.